Storage heaters could be an ideal cost-effective alternative to direct acting heaters or even gas central heating in your home. They use cheaper off-peak electricity supplied at certain times (usually overnight) when demand is low. The heat is stored until it is needed and then released slowly, keeping the house warm all day and night, if needed. The great thing about storage heaters is that they are clean, safe, require no maintenance and are 100% efficient. AC Electrical Services has been installing storage heaters in homes for many years and we will be happy to advise you on the best solution for your property. Installation is easy, with no pipes or flues, and you can benefit from warmth 24 hours a day for the cost of 7-10 hours’ worth of cheap rate electricity. 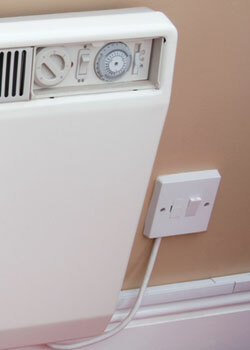 Our bespoke solutions will give you the flexibility to control the heat throughout your home. Talk to a friendly expert about storage heaters for your home. Great service, very helpful and reliable - highly recommend.